I'd like to reuse the existing decoder socket if possible - saves a little bit of work regardless if running on DCC or not... I've got a cunning plan based on my experience of having to study the Dapol tender top in far greater detail than most others would! Fingers crossed all pans out. I'm still playing around with the J6 tenders trying to get them to fit the Farish chassis and weight! However, I have finally gotten around to adding the handrails to the D49 tenders and detailed up the remaining two J6 locomotive front ends. However, this is not the reason for my posting today but to share my bargain buy! A total of £3.98 has been expended for the two lovely little toys above which included postage and packing. Even more impressive is that I purchased them yesterday and they arrived today! These are the copies/rereleases of the old Matchbox 'Models of Yesteryear' trams. While basic, I've seen some great things done with these and, while a tiny bit overscale, I think that they look like a better starting point than the Oxford Diecast tram. While London tramways were starting to decline in the 1930s they didn't stop running until the 1950s and this is something that I'd love to include on a layout (preferably motorised). 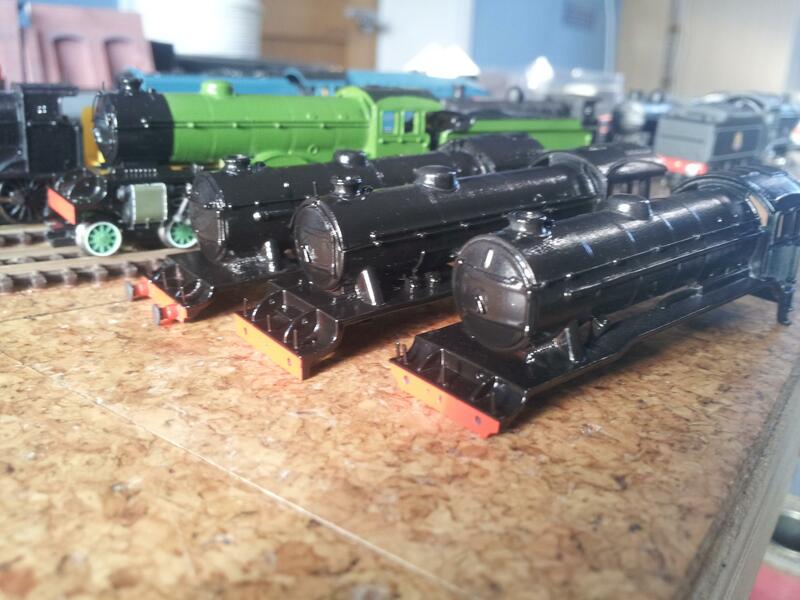 However, like the J69, these will be a longer term project so don't expect much progress on them for a little while yet. I've got a couple of areas to touch up but overall I've very happy with how this came out considering what a PITA it was to mask up! Interesting to see just how different the green is between the loco body and the bogie wheels (off a Dapol B1). Repainting these will have to happen over the next few days as well. I've also noticed from the picture above that I've lost a lamp bracket, I think I'll leave that for the moment and replace it once I've lined the loco out. 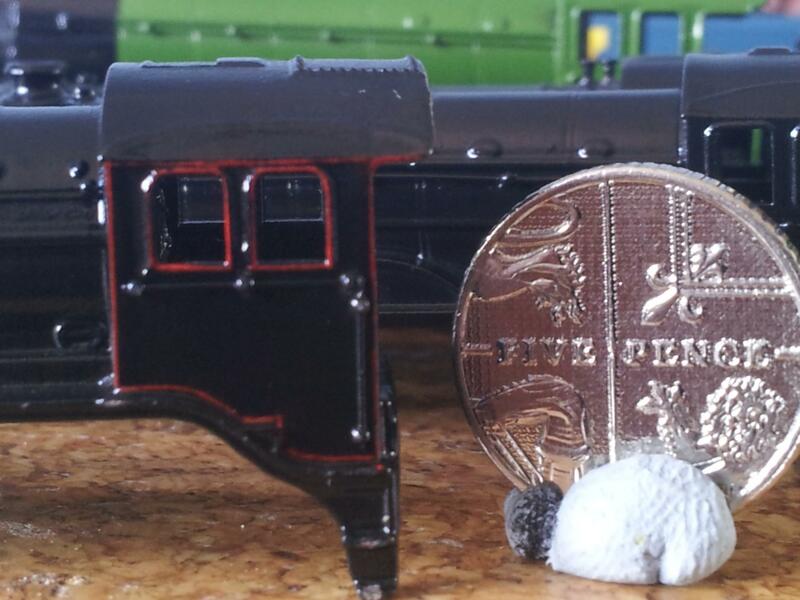 The etched van kits from my rolling stock thread have also been getting the airbrush treatment (finally!). I'll post up some pictures there once they've dried. Stripper? Does the domestic overlord know about this? Nothing wrong with a nice bit of green... It could be worse, it could've been crimson! Thanks Paul! I'll convert you to a proper railway company yet! I've no idea what the loco is but it does look very good, Steve. By Eastern do you mean Oriental? - It was the first new design of express passenger locomotive produced by the LNER - the Gresley A1s were a Great Northern pre grouping design. - It was the last 4-4-0 type the LNER built. - It was the most powerful 4-4-0 in the country until the advent of the Southern Schools class. This one will be Lincolnshire which had the distinction of being the only D49 allocated to Kings Cross (albeit briefly) and therefore the only one I could realistically justify within my geographical and time frame constraints. I've decided that I'm going to model her in the earlier LNER livery with number on the tender. This also means that I need to knock up a works plate for the cab side - and line around it! With Paul, it could mean anything! However, I'm going to interpret that as a sign that he is starting to see the light and move over to all things Gresley! Thanks for the detail on the D49 as I'd only heard of the 'Peak' diseasel. And what about the A4 chime whistles then Mick? Watery rubbish, Alex. And what's that 'thing' on the Flying Scotsman supposed to be? I used to work just up the hill from the Severn Valley Railway and, when they had visiting steam locos for a weekend, I could always tell when the A4 chimed. For Ivatt whistle, read Stanier hooter, two types - one designed to be mounted vertically, one designed to be mounted Horizontally. personally, my favourite is the one mounted on Bullied pacifics. Anyway, the nerve racking bit has started this afternoon... LINING! Despite the evidence in the picture the lines are whole and consistent. The issue is the slight fluctuation under some areas of beading which my phone camera can't seem to pick up. This has been done using my new Kern ruling pen (more commonly known incorrectly as a bow pen or so I'm informed) and the lines are around 0.1mm thick. The K3 above is my own so I'm using this as my testing and practice before tackling the more complex BR mixed traffic lining. I've managed to chip a little paint away from the footsteps by using a metal ruler, I'll be cutting some straight bits of plastic for the next stage to protect the paint a little better. There are a couple of bits that need a little cleaning up and this can be done with a OOO brush moistened with white spirit once the paint has gone tacky - alternatively I can simply paint them out with some gloss black once completely dry. Overall, I'm reasonably happy with this first stage. I'll be lining the valance under the footplate too but I'm waiting for some spare pens that'll fit on my bow compasses (the pen supplied with this is useless no matter how much I've tried to hone the pen!) so I can do some offset lining. Eek! With my hand shake I'd never accomplish anything like that so my hat is doffed to you, sir. I'm having problems with lettering on coach side images, looks great at the size I edit at, but downsize it to fit the coach side and it becomes almost illegible; I think the term is pixellated, but I'm not elated with these pics!